This volume addresses children and young people's relationships both within and beyond the context of the family. It begins with familial relationships and the home by examining the social and cultural complexities of families, intimacies and interdependencies, including the dynamics of families as spatial units (nuclear, multi-generational, alternative) and the roles that children play (as carers etc.). 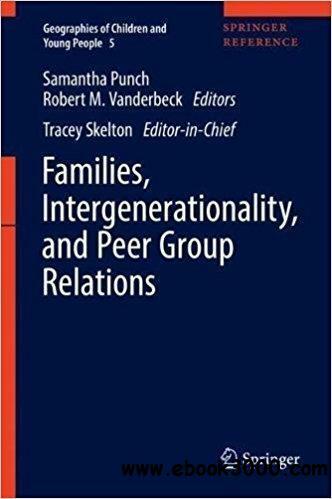 In addition to considering child/parent relations, sibling relationships and birth order, the initial section includes particular dimensions of children's familial relationships in diverse contexts, such as family food practices, aspirations and work practices. The second section explores geographical dimensions of adult/child relationships beyond the dynamics of the family and across the lifecourse. It considers the roles that intergenerationality plays in children's and young people's lives as well as their links with wider communities. The section addresses broader conceptual issues and themes (child-adult relationships outside the home; intergenerational geographies and spaces; and the intergenerational city) while also providing more focused discussions of current issues related to the geographies of intergenerationality including adoption, looked after children and fertility. The final section addresses children and young people's relationships with one another: friendship, peer group relations, and sexualities. It explores the geographies and spatialities of affective relations and emotional practices among children and young people. Geographies of bodies and embodiment and their connection to identities is an important part of this section. The chapters range from cross-cultural comparisons of age mixing among children to specific kinds of relationship formations between children and young people (e.g. friendship; sexual relations; gangs; bullying) and the spaces and places (including cyberspace) that facilitate, impede and organise these relationships. The diverse relationships that children and young people form with both one another and with adults have significant geographical dimensions.